Feeding your cat the good stuff at mealtime should be a top priority. 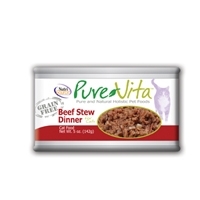 That's why there's Pure Vita Grain Free Beef Stew Dinner Canned Cat Food! This delicious meal ensures that you're feeding your cat all the essential vitamins, minerals and nutrients that he needs to be healthy, strong and active! Packed with a beef stew dinner that's so good, your cat will think he's eating from your plate! 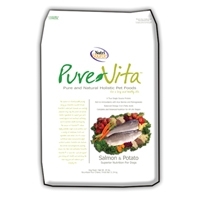 Pure Vita Grain Free Beef Stew Dinner Canned Cat Food is formulated with a single source protein and a smorgasbord of wholesome fruits and vegetables---things that your feline pal can only benefit from! So go ahead and dish out some goodness! Feeding your cat the good stuff at mealtime should be a top priority. 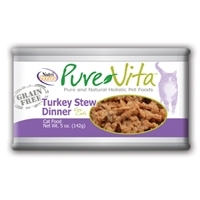 That's why there's Pure Vita Grain Free Turkey Stew Dinner Canned Cat Food! This delicious meal ensures that you're feeding your cat all the essential vitamins, minerals and nutrients that he needs to be healthy, strong and active! Packed with a turkey stew dinner that's so good, your cat will think he's eating from your plate! 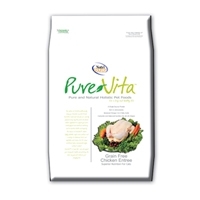 Pure Vita Grain Free Turkey Stew Dinner Canned Cat Food is formulated with a single source protein and a smorgasbord of wholesome fruits and vegetables---things that your feline pal can only benefit from! So go ahead and dish out some goodness! 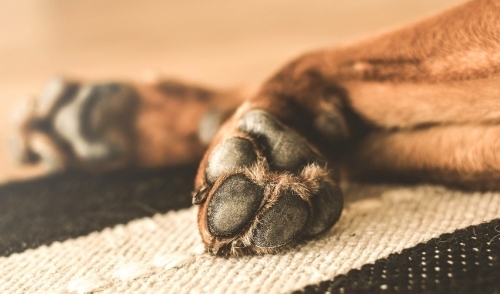 Feeding your cat the good stuff at mealtime should be a top priority. That's why there's Pure Vita Grain Free Chicken Stew Dinner Canned Cat Food! This delicious meal ensures that you're feeding your cat all the essential vitamins, minerals and nutrients that he needs to be healthy, strong and active! Packed with a chicken stew dinner that's so good, your cat will think he's eating from your plate! 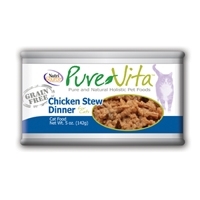 Pure Vita Grain Free Chicken Stew Dinner Canned Cat Food is formulated with a single source protein and a smorgasbord of wholesome fruits and vegetables---things that your feline pal can only benefit from! So go ahead and dish out some goodness! 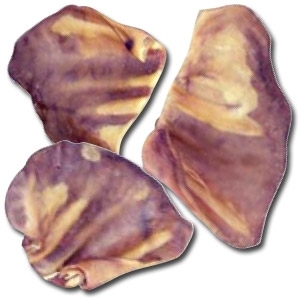 Combines the delicious taste of Chicken with a variety of nutritious fruits and vegetables. Because it is made by NutriSource, you can be sure it has our exclusive “Good 4 Life” system and the finest quality, pure ingredients available for your cat or kitten. 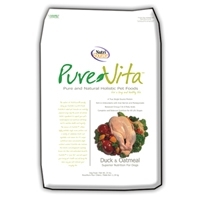 PureVita Duck & Oatmeal is made with Delicious Duck & Oatmeal. It is a true single source protein which is rich in Antioxidants with Pomegranate and blueberries. It has Complete and Balanced Nutrition for all of life’s stages. 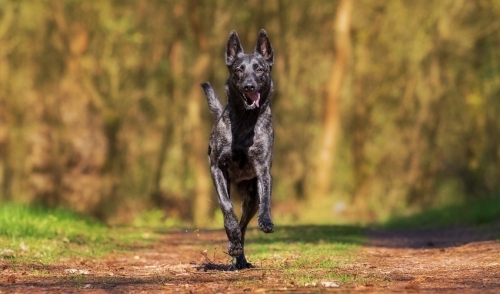 This Pure and Holistic Pet Food is appropriate for all life stages of your dog’s life.